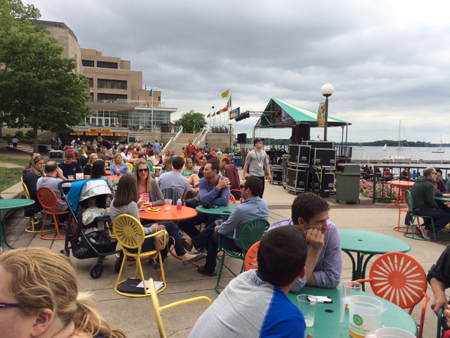 Dr. Katherine Rice, Applications Scientist at CAMECA Instruments, Inc.
Last week was a great week up here in Madison for our bi-annual users’ meeting, with about 90 atom probe enthusiasts making the trek to Madison, WI to discuss the finer points of atom probe tomography (APT). There were plenty of great sessions involving, for example, correlative microscopy, cryo-atom probe, and new ways to detect evaporated ions. Lest anyone think that we are too serious up here in Wisconsin, we also enjoyed talks on atom probing rodent teeth and even beer, as well as having several social events where our attendees could sample local brews. Many of the users have been implementing transmission EBSD (or TKD, as some folks prefer) on their needle-shaped atom probe specimens which are typically shaped by a focused ion beam (FIB) microscope. This allows for identification of any grain boundaries present, and also helps position a grain boundary close to the specimen apex so there is a good chance it will be captured in an APT analysis. Atom probe specimens usually have a radius of ~100 nm which makes them ideally sized for transmission EBSD at SEM voltages between 20-30 kV. 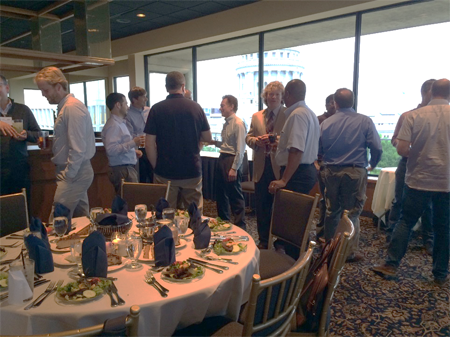 The users’ group meeting also marked another special event: the debut of Atom Probe Assist (APA) mode in the TEAM™ software. Transmission EBSD can be challenging, but APA mode makes the analysis faster and easier by implementing recipes for background subtraction developed by EDAX and by skipping mapping of areas not intercepted by the specimen. 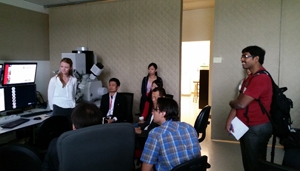 We had about 20 users at the Tuesday demos of APA mode and another few at an additional demo on Friday. CAMECA’s Dr. Yimeng Chen manned the FIB and quickly targeted a grain boundary for FIB milling while our EDAX friend Dr. Travis Rampton took maps after each milling step to make sure the grain boundary was contained in the specimen. 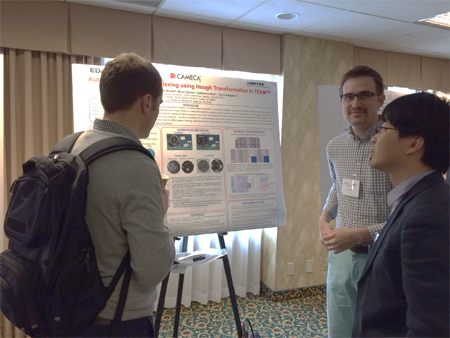 Yimeng Chen and Travis Rampton present a poster. Sample holders that work well for t-EBSD and FIB were also on debut at the meeting. Many of CAMECA’s atom probe users mount up each specimen to our Microtip coupons, which are 3 mm X 5 mm pieces of Si that hold 22 flat topped posts. 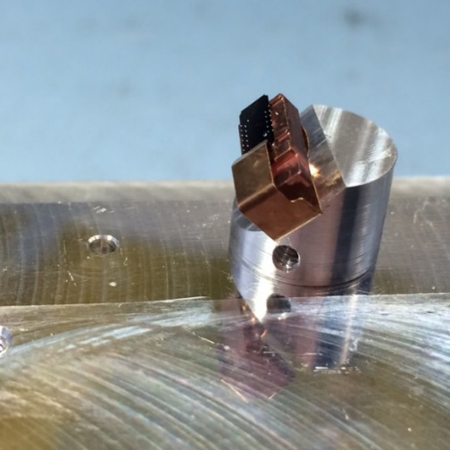 Our Microtip Holder (affectionately nicknamed the Moth) was developed to do transmission EBSD on each of 22 mounted specimens, and then transfer the stub portion directly into the atom probe. Even if you don’t do APT, these microtip posts are a convenient way to mount multiple thin samples for transmission EBSD. It was incredible to see the explosion of transmission EBSD for atom probe, and the cool things that many LEAP users are discovering when they try it out on their atom probe samples. Perhaps the greatest strength of this technique is how easy and integrated it is in the atom probe specimen preparation process. You don’t even need to move your sample or the camera between steps when you are shaping a liftout wedge into a specimen that is atom probe ready. I look forward to hearing about the new applications that are being discovered when combining t-EBSD and APT!